The climb to the rocky summit of Echo Peak is a 100 percent perfect tour for both experienced skiers and skiers desiring to tackle their first ski ascent. Easy access, although more than three miles to the start of the climb, and the easy route-finding will give newcomers to peak bagging on skis a sense of security. 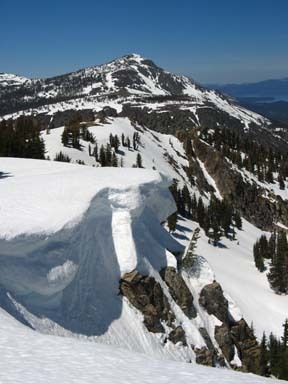 Skiers skilled in the art of telemarking can enjoy 1300 feet of linked turns on the descent. The climbing, through a mixture of open and wooded areas, is steady and the gradient only modestly steep for a peak climb. The view from the summit is a 360-degree panorama — an ideal setting for a well deserved lunch. Directly below the steep cliffs to the north are Angora Lakes and almost at your finger tips are Fallen Leaf Lake and Lake Tahoe. 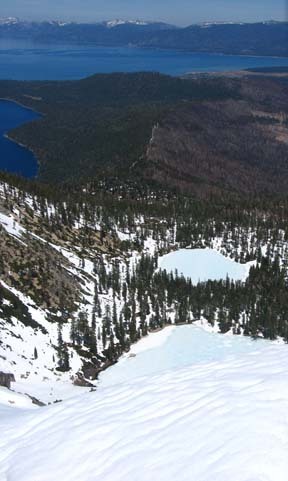 Of course, you will have more than sufficient opportunity to enjoy the Echo Lakes basin and the views to the south. One word of advice for planning a trip to Echo Peak: Because the entire ascent is on a south-facing slope, new fallen snow quickly turns to mush in afternoon sun. 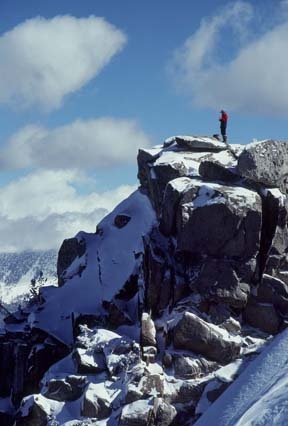 Therefore, unless you make your ascent during or immediately after a storm, it is best to plan this tour for a time when the snow is consolidated. There is nothing better than the Sierra's corn-snow! The good news is that the snow consolidates fast due to the southern exposure. Lastly, Echo Peak is on the border of Desolation Wilderness and the tour to the peak goes through the Wilderness. 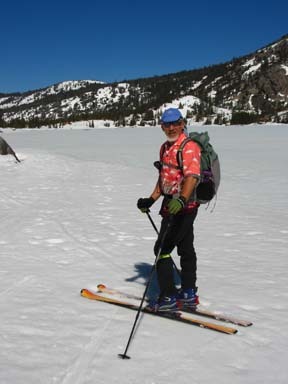 According to the Forest Service you must obtain a permit for day use as well as overnight camping in Desolation Wilderness. Retrace the route for 5.1 miles back to the trailhead (1).